This is an unusual little piece, and as far as I can tell, it's never been used. The top clips shut, but when you open it and flip it out, it has a place to rest your cigarette. It was obviously meant to be carried in a pocket or purse. 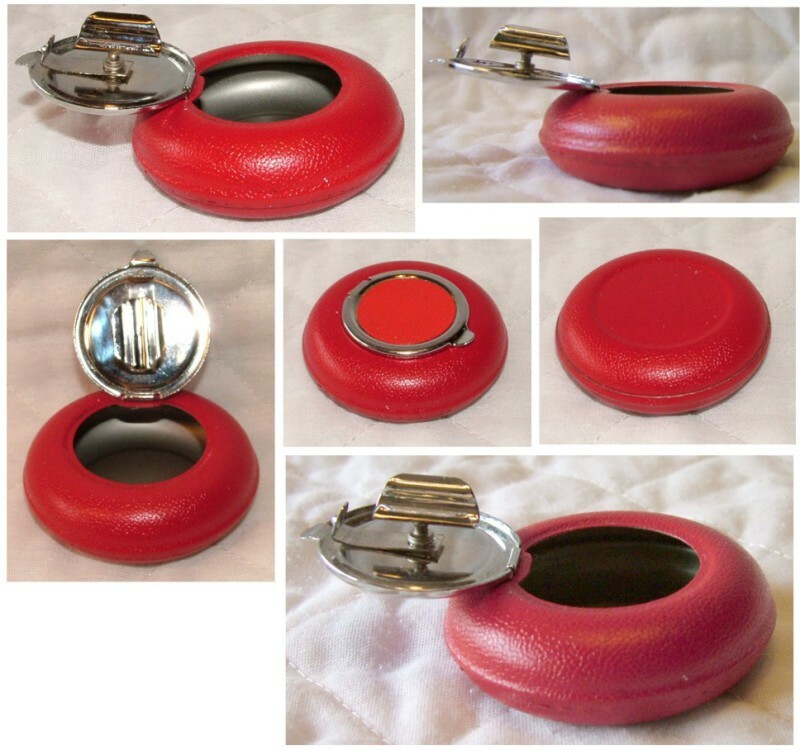 It's metal, encased in red vinyl with a false leather finish. It's less than 2.5 inches wide, maybe a little over .5 inches deep. It weighs 1 ounce. It's in good condition - I don't think it's ever been used. A unique, nostaligic piece of tobacco memorabilia. This is an unusual little piece. I believe it has been used, as there is yellow staining on the base inside the box. The outer surface has tiny scratches from riding in somebody's purse or pocket. The box is a burnished gold or brassy color, witha viny/paisley design on the top. The inside is paineted in white lacquer. It clips tightly shut, and has a button at the front to push in order to open. 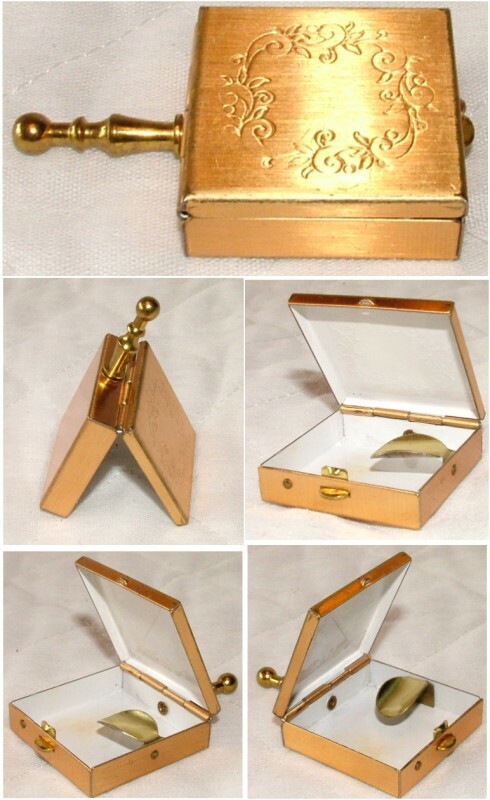 It has a little gold oval cigarette rest attached to the inside of the box. It has a little metal handle and reminds me a bit of the bedwarmers they used to put coals in and place in beds to warm them on a cold night. It's less than 2.5 inches long, including the handle, and less than 0.5 inches deep. It weighs 0.8 ounces. This piece is well over 30 years old, and does have some light scratching inside and out. It is in otherwise good condition. A unique, nostalgic piece of tobacco memorabilia.